The Egyptians begin their assault. So, it is October 6th1973, there is one company of Israeli mechanized infantry in the stronghold with two companies in reserve. These were all reservists and I will rate them as average. There is one company of M48’s with the reserves, these are regulars and will be rated good. 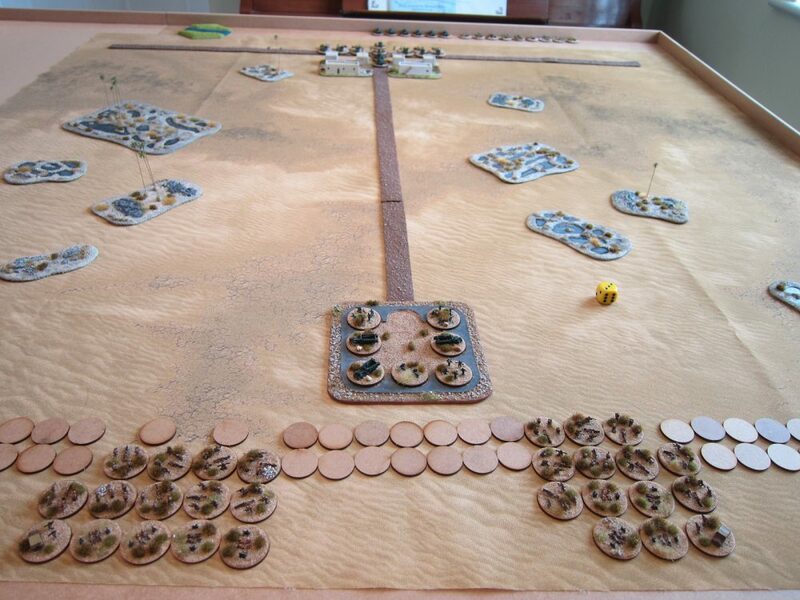 The Egyptians are a commando assault brigade, these guys trained for years for this operation and I am going to make the two assaulting battalions engineers, they will be the best the Egyptians can muster and will be rated average. Breaching the minefields and the wire. The lines of discs represent first minefields then barbed wire. The assaulters breach the minefields on a +3 with a +1 modifier for supporting stands which have the engineering capability. The Egyptians had nearly 2000 artillery pieces and landed 10,500 shells in the opening minutes alone. The opening barrage lasted nearly an hour. 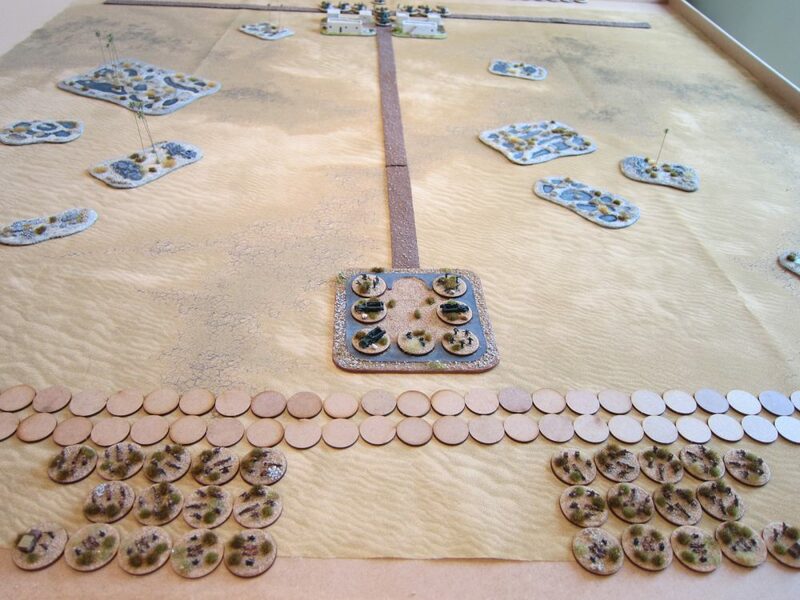 The Israeli troops in the stronghold and in reserve will all be suppressed for two turns. 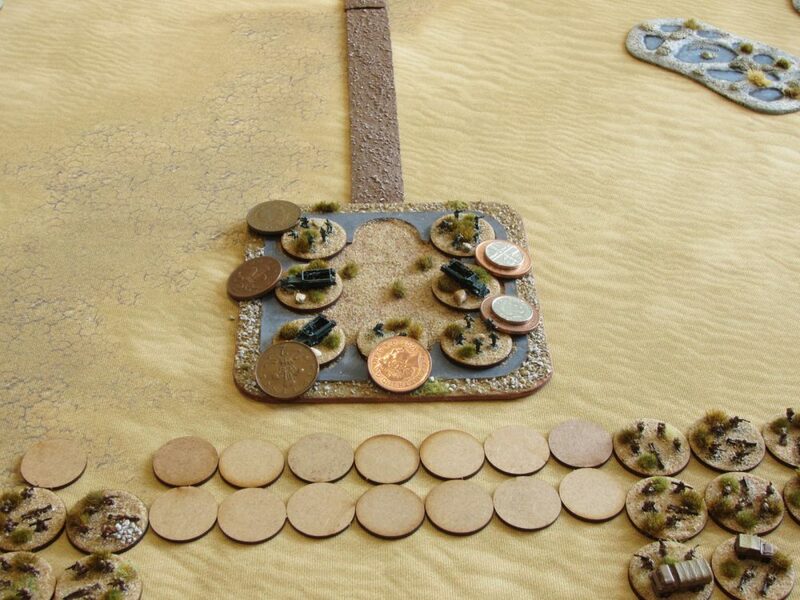 I am going to assume that the Egyptian artillery is fully ‘available’ for four turns. The Egyptians have two support groups of 152mm towed howitzers giving them six fire units. The Egyptian commando brigade has three recon stands. Each will place one barrage of two fire zone markers, each marker will have one fire unit allotted to it. 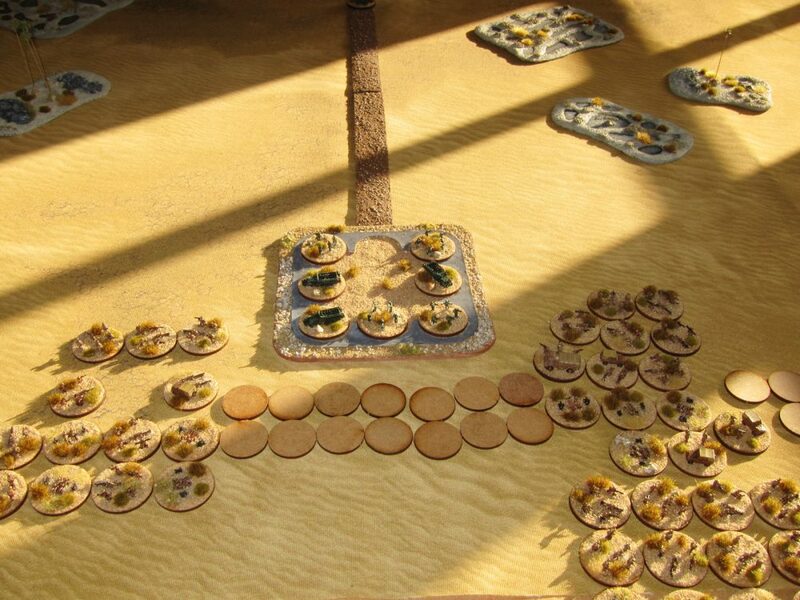 These will be fire blow barrages as the Egyptians are hoping to assault the stronghold, they will all be HE. Egyptian artillery accuracy is a 5+ with a 0 modifier for average troops. One barrage comes in at full effectiveness (with the silver markers), the other two are reduced. The barrage at full effectiveness has an area fire index of 8 per marker, the infantry are in heavy cover so a roll of 3+ will suppress them, the M3 is open topped and doesn’t count as in cover, a 6+ will cause a quality check otherwise it will be suppressed. One infantry stand and the M3 are suppressed. The other barrages are reduced, the infantry is suppressed on a 5+, the M3’s on a 3+. The stronghold ends up with 5 suppressed A stands out of 7. Egyptian barrages, one is at full effect, two are reduced. The stronghold ends up with 5 suppressed A stands out of 7. The Egyptians pour through the gap in the minefields and wire. There is more wire around the actual strongpoint which they must breach before they can assault. The Israeli stands all fire on overwatch, suppressed infantry roll 2 dice and are -2 with -1 for overwatch for a total of -3. Unsuppressed infantry are -1 for overwatch. M3’s fire 1 dice and are -2 if suppressed -1 otherwise. Two Egyptian stands are hit, one passes its quality check on a 5+. There is no close combat. 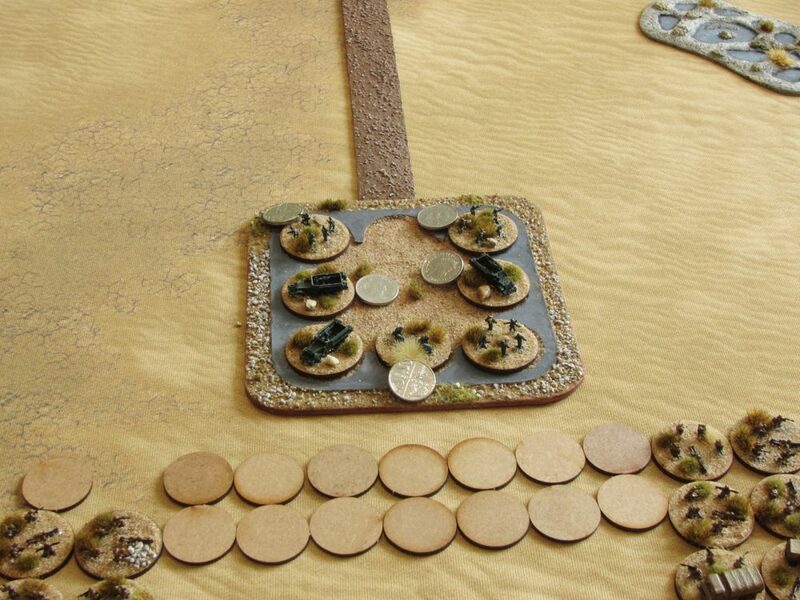 The Egyptians that are able to fire back, all miss or the Israeli’s make their terrain saves. The Israeli’s become the attacker, they require a 6 on a D6 to receive reserves, they fail. The suppressed A markers are removed from the Israeli’s in the stronghold. The M48’s and the mechanized infantry race down the road to the rescue. 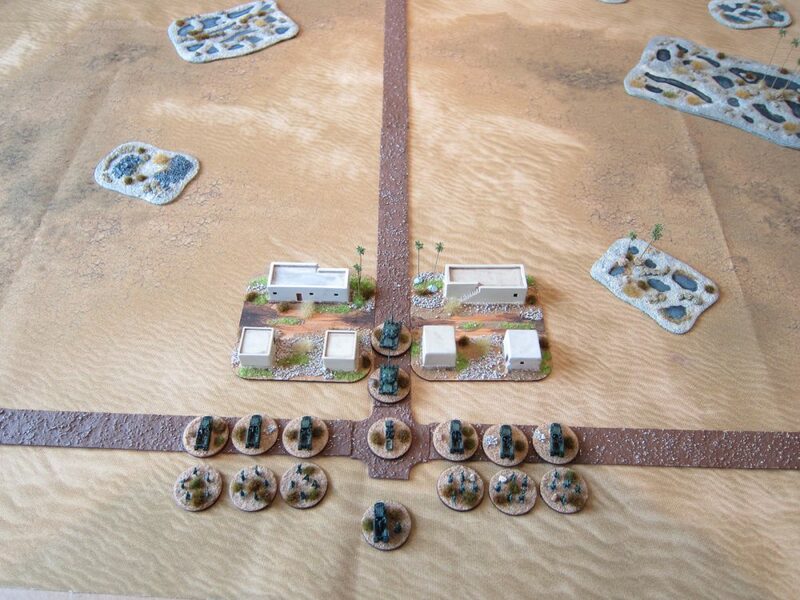 None of the Egyptians may be on overwatch as they all moved, there is no close combat so the Israeli’s blaze away and remove 3 stands of Egyptians. Nothing can be placed on overwatch as everything moved or fired.